More than 8,500 new cases of oesophageal cancer are diagnosed each year, with the incidence of cancers of the lower oesophagus / gastro-oesophageal junction rinsing faster than any other solid organ tumour. They are 3 times more common in men. Other rare subtypes of oesophageal malignancy include leiomyosarcoma, rhabdomyosarcoma, or lymphoma. Early stage oesophageal cancer often lacks well-defined symptoms, which may account for the majority of patients presenting in the later course of the disease. Any patient with dysphagia should be assumed to have oesophageal cancer until proven otherwise. There are many causes for dysphagia, as discussed in our dysphagia article. Importantly, the dysphagia should be classified as either a mechanical or neuromuscular disorder, as this can significantly affect future investigations. However, any patient presenting with dysphagia should be assumed to have oesophageal cancer until proven otherwise. Any patient with a suspected oesophageal malignancy should be offered urgent upper gastrointestinal endoscopy* (also termed an oesophago-gastro-duodenoscopy, OGD), to be performed within 2 weeks. Any malignancy seen on OGD will be biopsied and sent for histology. *Patients who are not fit for an OGD can occasionally have a CT scan (neck and thorax) however this is much less sensitive and specific. Any palpable cervical lymph nodes may be investigated via Fine Needle Aspiration (FNA) biopsy and any hoarseness or haemoptysis may warrant investigation via bronchoscopy. Sadly, the majority of patients present with advanced disease. Approximately 70% of patients are therefore only treated palliatively. As with all cancers, the management of oesophageal cancer patients should be determined by the multidisciplinary team (MDT), with input from general surgeons, oncologists, specialist nurses, nutritionists, and the palliative care team. The choice of curative treatment strategy will depend on tumour type, site and the patient’s general fitness and co-morbidities. Surgical treatment is a major undertaking as both the abdominal and chest cavities need to be opened. Patients have one lung deflated for about 2 hours during surgery; 30-day mortality rates are around 4% and it takes 6-9 months for patients to recover to their pre-operative quality of life. Post-operative nutrition is a major problem for these patients as they lose the reservoir function of the stomach. Many centres will routinely insert a feeding tube into the small bowel (a “feeding jejunostomy”) to aid nutrition. However, most patients will need to eat 5-6 small meals per day and “graze” to meet their nutritional requirements as they physically cannot fit in 3 normal size but intermittent meals. For a small number of patients with very early cancers or high grade Barrett’s oesophagus, an option is Endoscopic Mucosal Resection (EMR), which is the removal of just the mucosal layer of the oesophagus. EMR can be combined with radiofrequency ablation (RFA) or photodynamic therapy (PDT) afterwards to destroy any malignant cells that may be left. Those patients deemed too unfit or unsuitable for curative therapy can be offered a range of palliative options. Patients with difficulty in swallowing should have an oesophageal stent placed where possible (Fig. 3). Radiotherapy and/or chemotherapy can be used for palliation to reduce tumour size and bleeding, temporarily improving the patient’s symptoms. Photodynamic therapy (PDT) is a treatment that uses a photosensitizing agent, that when exposed to a specific wavelength of light produces a form of oxygen that kills nearby cells. Nutritional support is essential for this patient group, as progression of the disease can lead to significant dysphagia and cachexia. Thickened fluid and nutritional supplements should be offered (usually via the nutrition team). If dysphagia becomes too severe to tolerate enteral feeds, a Radiologically-Inserted Gastrectomy (RIG) tube may need to be inserted, to bypass the obstruction. 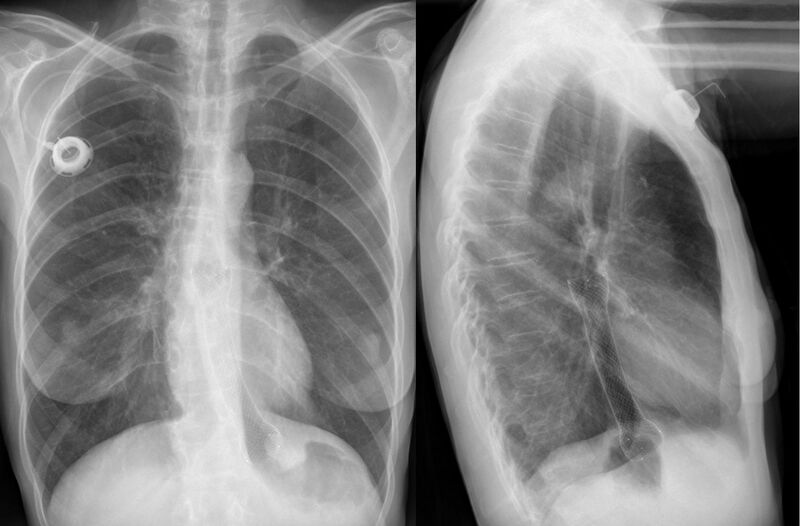 Figure 3 – Oesophageal stent, as seen on x-ray. 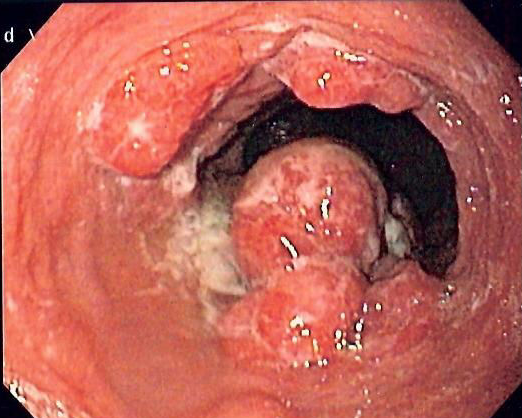 The prognosis for oesophageal cancer is generally poor due to late presentation. Overall five-year survival is 5-10%. The outcome of surgically treated patients have survival depending on stage of the disease, with a 5 year survival for stage 1 cancers at around 60%. Palliative treated patients have a median survival of 4 months. Any patient with dysphagia (difficulty swallowing) has oesophageal cancer until proven otherwise. Which of the following subtypes of oesophageal cancer is the most common in developing nations? Which of the following staging investigations are not usually required in the work-up for a suspected oesophageal malignancy? Which of these is not a key staging investigation in oesophageal cancer? Which of the following best describes the approach for an Ivor-Lewis procedure?